If you recently earned your undergraduate degree, you may be itching to go back to school and earn that masters. But for many recent college grads, going back to school for another few years simply isn’t an option. Whether it’s because money is too tight or because it will take too long, many people skip grad school to join the work force, even if they wanted to attend grad school. With the rise in popularity and availability of online graduate school programs, lots of recent undergrads who never would have been able to go to grad school now are able to. If you’re debating enrolling in an online masters program, check out these reasons why choosing an online graduate program is the right choice for you. One of the main reasons that people never go to grad school is because sometimes it doesn’t work with their schedules and demands too much. When attending grad school, it’s often advised that you don’t work (or work very little) because you’ll be dedicating most of your time to the graduate program. With an online graduate school program, you get more flexibility that allows you to work while in the program. You can be working full time, part time, or even a stay at home parent and still earn your graduate degree online on your own time. Since you don’t have to dedicate specific hours to going to a classroom each week, you’ll have more flexibility to do the other things that life requires. Graduate school is expensive, no matter how you look at it. Many people don’t go to graduate school simply because they can’t afford it. While an online graduate school program still isn’t cheap, it’s much more affordable than a comparable program from a brick and mortar university. The reason that an online program is typically cheaper is because there aren’t as many costs associated with the university, like maintenance and athletic fees. In addition to tuition costs, you’ll save a lot of money on other things that you probably won’t even realize at first. You won’t have to pay for a costly parking permit every term to park on campus, which could save you hundreds right off the bat. You also won’t have to spend money on gas while you commute back and forth to campus every day. One reason that many people fail out of graduate school is because it’s too demanding and fast. 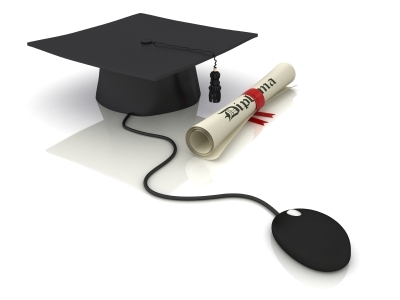 With an online graduate school program, you can work at your own pace and won’t be rushed. Not only will it make it less stressful to complete your degree, but you’ll also retain more information because you aren’t rushed through the courses. Everybody learns at a different pace, and an online graduate degree program lets you learn at yours. No matter if you learn better by hearing or by reading, you’ll have both those options with an online program. Your education will truly be tailored to fit your needs.